Nick Faldo impersonates Sergio Garcia's bunker tantrum on the Dan Patrick Show. One week later and we’re still talking about Sergio Garcia’s bunker tantrum in Saudi Arabia. Now, Nick Faldo is getting in on the action. Faldo mockingly impersonated Garcia’s antics Thursday night in Pebble Beach, and even compared him to turtles laying eggs. Faldo performed his “swing” imitation while appearing on the Dan Patrick Show, which is in Pebble for the AT&T Pebble Beach Pro-Am. The show posted a video of the appearance to Twitter in which Patrick asks Faldo questions as he hits on a range. 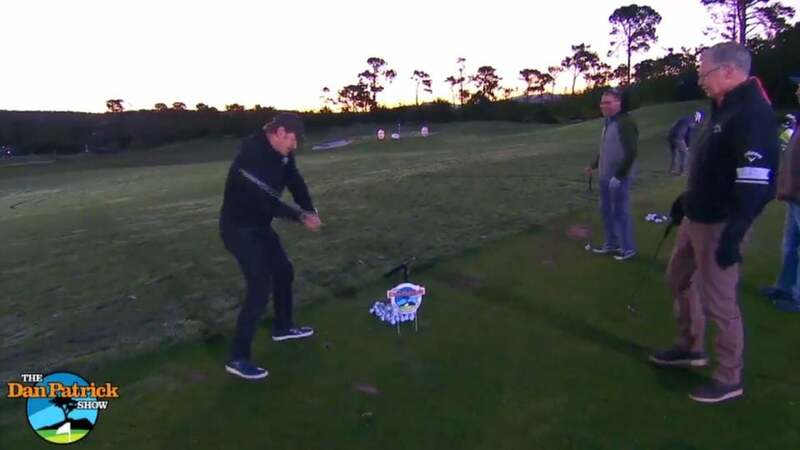 Faldo starts to work through some names of well-known golfers to show off proper backswing-downswing tempo, including Ernie Els, Adam Scott, and Jason Day. But then he switched to some less applicable names (like Colin Montgomerie) and starts doing some impressions. After reminding the hosts of his impression of Rory McIlroy throwing a club last year, Faldo says, “But I’ve got a new one for this year. I’ve got Sergio Garcia,” then gives his best shot at the bunker-slashing technique. In case you somehow missed it, Garcia had quite an eventful experience last week at the Saudi International. Garcia was disqualified after intentionally damaging five greens out of frustration. A day earlier, cameras caught Sergio slamming and slashing his wedge into the sand after a poor bunker shot.